families and locals alike and is truly a family beach. 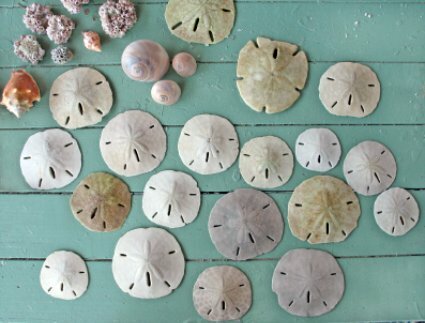 A sand dollar is the ultimate 'find' on a beach. They are delicate and will break easily. A favorite memory of Ft Myers is wading out to a sand bar and finding a 'zillion' sand dollars congregated around the sand bar; a few were 7-8 inches across. As many times and as many Florida beaches I have shelled, I rarely find more than two in one place so this was very exciting. I filled my bag completely with the very delicate shells and took them to my balcony. Being greedy has its downfalls; many were broken when I got upstairs. I realized they would never make the plane trip home so the day before I left, I walked the beach and strategically placed sand dollars along the beach to delight other beachcombers. After you've had your sun therapy and your skin is a golden bronze, or enough to make the folks back home jealous, you may be ready for.... Phase two; a venture into the sophisticated city of Fort Myers for a big change of pace. Fort Myers Beach Florida is booming with lots of daytime activities, museums, art, shopping, eating and also offers some of the best nightlife in the state of Florida. Come to the "city of Palms" prepared to have a vacation to remember! Visit the “Times Square” of Estero Island (where Ft. Myers Beach is located) on Estero Blvd for some great night life and bars as well as many great beach shops, restaurants and hotels. Lovers Key State Park is also located nearby and lives up to its name as a great place for couples and families to kick back and enjoy nature’s finest features and animals. Bring along your favorite canine and visit the “Dog Beach” which is a rarity among Florida’s beaches, as most beaches do not let you to bring your dog on the beach. Watch your four legged friends frolic with each other in the water and run on the beach. Visit Thomas Edison’s winter home and behold some of his genius in the cool inventions he created for his annual escape from the cold. Kids of most ages: Enjoy a dolphin and manatee viewing and shelling excursion aboard Sunset Ride Private Charters for fun for the entire family and a one of a kind Fort Myers experience. Eating: For very inexpensive yet delicious food, check out The Tuckaway Bagel and Waffle Café or try some of the yummiest pizza you’ve ever tasted at Surf Pie. Sleeping: The moderately priced Edison Beach House offers a comfortable stay right on the beach and has full kitchens. Dolphin Inn is a bit less expensive with large and accommodating rooms and is close to the beach, restaurants and shopping. Ft Myers is friendly here, old and young alike. I have seen children meet other children and within minutes, they are sharing toys and tools and constructing sandcastles or burying each other in the sand. Fort Myers Beach Florida is also the entrance to Captiva Island a gorgeous barrier island, not to be missed.